Last week, work and life got the better of me and for the first time in almost three years I missed a blog. To make it up to you, this week I’m combining two in one: a bookshop and a bookshop experience so good it had deserved a blog of its own. 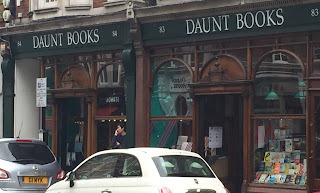 Every now and then I tell you about how I’ve finally met one bookshop or another that’s been particularly high up my ‘must-visit’ list, and today I do the same. 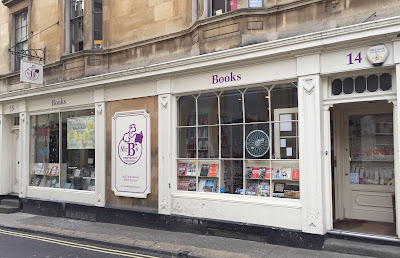 The bookshop in question is Mr B’s Emporium of Reading Delights, in Bath, and its popularity means it’s among what I’ve affectionately come to think of as the rock stars of the indie bookshop world. 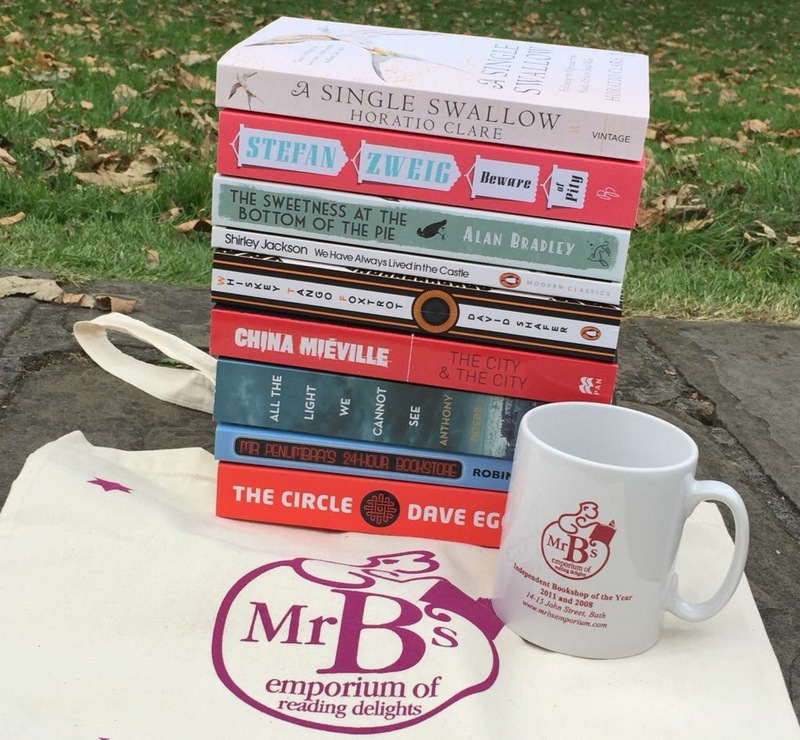 Mr B’s fame is already far-reaching and not just as a bookshop, because it’s also the home of the hugely popular Reading Spa. Back when I wrote my first blog entry (and before I found out how many of you would read my witterings, for which I thank you) I’d naively planned to dedicate one early post to simply telling readers how great the Reading Spa sounds, and what a brilliant idea it is. Not forgetting hinting to all my family they might like to club together to buy me one for Christmas. Instead I got carried away visiting lots of lovely bookshops and the verbal hints to my family took years to sink in. Then last Christmas I opened an envelope that made me squeal with excitement and actually shed a tear or two of joy. One of my sisters had very, very generously bought me a voucher for an Extravagant Reading Spa. Unfortunately it turns out I’m not the only person with a generous relative, because my lack of organisation and Mr B’s popularity meant whenever I phoned up to arrange my spa they were always fully booked. Finally, for the start of July, I set a date for my trip to Bath. The bookshop itself is found on a side street just above the main shopping centre and ever so slightly down the hill and around the corner from the Jane Austen Centre*, but as Bath’s so compact it shouldn’t take you long to locate. Its three floors are bright and inviting, while the staff are particularly welcoming. I actually visited (I think/hope anonymously) once a day for four days during the course of my holiday and everyone I met was so friendly it felt like I was meeting up with old friends. 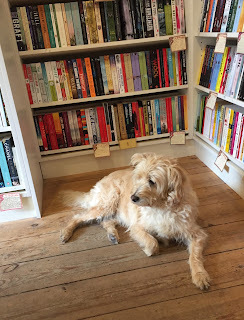 They also have a bookshop dog, who’s apparently very infrequent in her trips to work but was in to say hello on the Wednesday afternoon of my final visit. Vlashka sits and surveys the browsers in the fiction section, quietly contemplating the variety of browsers' choices – I couldn’t help but wonder what she made of my haul. And it was a very large haul. the Reading Spa comes in two flavours, Delightful and Extravagant. As I had the latter, my haul included £75 of books, a Mr B’s tote bag, bookmark and mug and a fully stamped-up loyalty card (worth £5) for my next visit. Best of all though is the conversation. For the past six moths of me getting excited about this experience friends have been asking why, given my love of books, someone has to be paid to talk books with me. I can now confirm a Reading Spa is so much better than that. 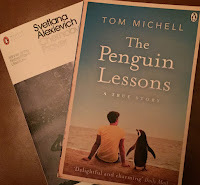 When you make a regular visit to a bookshop, you say hi to the bookseller, ask for a recommendation and after a short while you come away with a book or two. Which is great and an experience I'll never tire of. 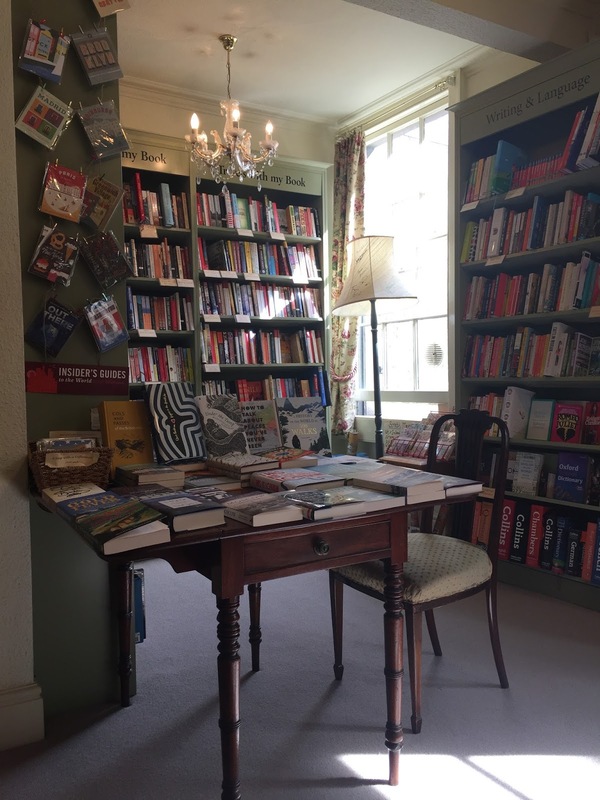 In a Reading Spa, you sit down with a cup of tea and a piece of cake (I had a chocolate brownie) and enjoy around an hour of dedicated bookseller attention. I think it probably helps if you go along with a request in mind, so mine was to be taken away from the books everyone has read. Possibly not the easiest or most obvious of requests to fulfill, but Naomi who was hosting my Reading Spa rose to the challenge. We talked books loved, favourite genres, recent reads and my ridiculously large TBR pile. I confessed a few dislikes and prejudices too. None of it phased Naomi. She made a few notes, asked a few more specifics and then left me in the company of the eminently readable Letters of Note (the one about dam beavers is particularly joyous). A short time later Naomi returned with a pile of between 15 and 20 books, most of which I'd not seen before and only one of which I already owned. Given how many books I buy for this blog I was very impressed by her success rate. Starting with The Circle by David Eggers, Naomi then talked me through each book she’d selected, telling me a little about it and explaining why she thought I might like it. I was increasingly impressed by the thought that had gone into the selection in front of me as throwaway snippets from our previous conversation caught my attention. It was brilliant. 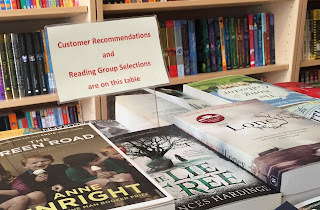 In fact the only complaint I could make is that the recommendations were too good and it was almost impossible to decide which books to leave behind. Naomi and I talked for around an hour and a half as she helped me choose a few definite purchases, then when I was ready she left me to have a read and a think. 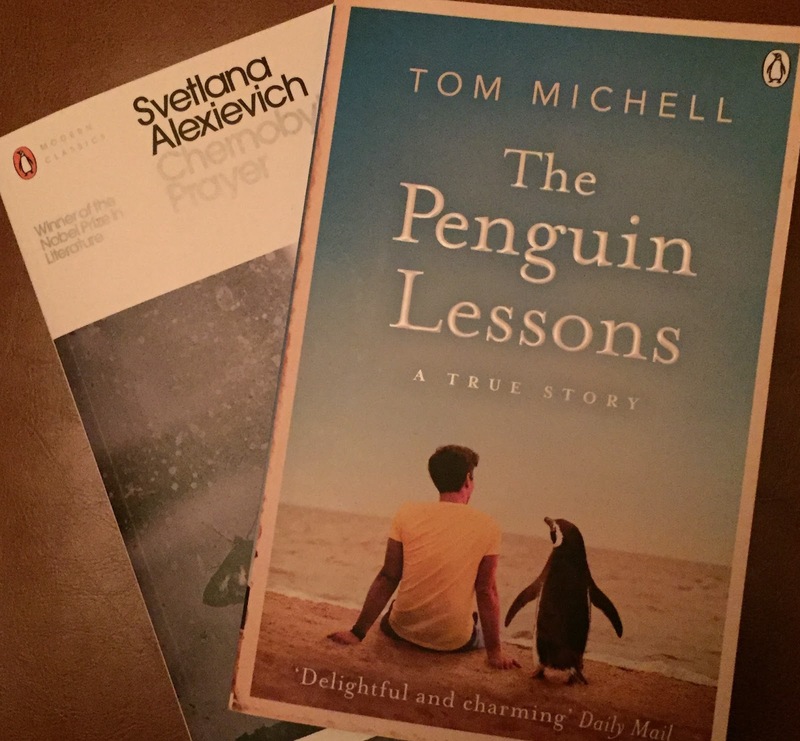 I was so comfy in the upstairs bibliotherapy room – enjoying the books and bookshop atmosphere – that in total I spent more than two hours in heaven. 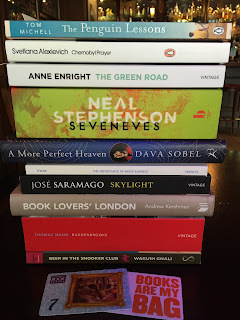 It took me a while to decide, but my eventual choice of purchases was: The Circle by David Eggers; Mr Penumbra's 24-hour boookstore by Robin Sloan; All the light we cannot see by Anthony Doerr; The city & the city by China Mieville; Whiskey Tango Foxtrot by David Shafer; We have always lived in the castle by Shirley Jackson; The sweetness at the bottom of the pie by Alan Bradley; Beware of Pity by Stefan Zweig; and A single swallow by Horatio Clare. 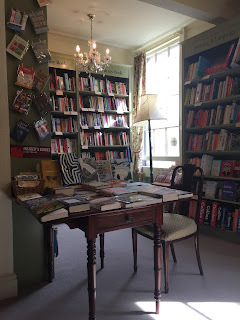 As you can probably imagine, I was thrilled to be taking such a full bag of books away with me, but when I look back at the day the bookshop itself was as important in my experience as was the excellently extravagant Reading Spa. 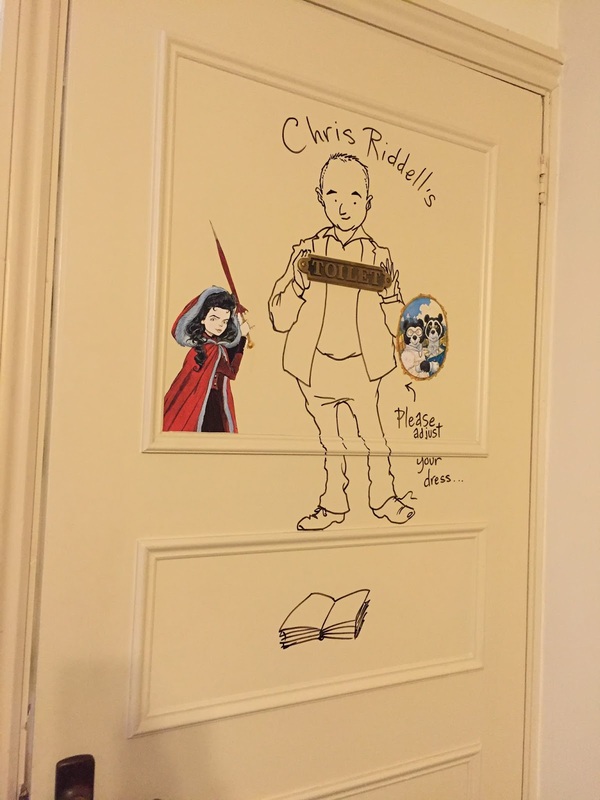 From the striking booky furniture to the thoughtful decorative details (including the Chris Riddell toilet), the shop felt great to be in, but most important were the books. 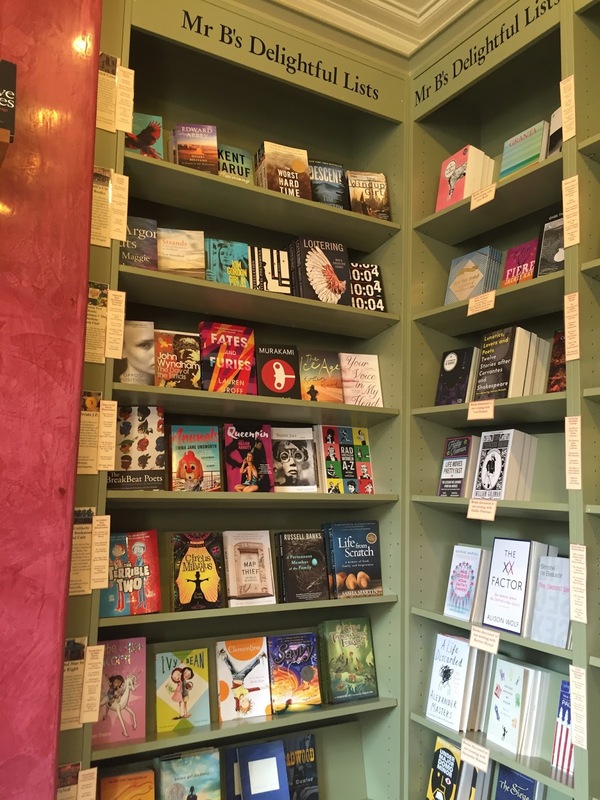 I particularly enjoyed their lists shelves, which ranged from individual recommendations by the booksellers to top fives from other bookshops and people of note – including one from Florence of And The Machine fame. 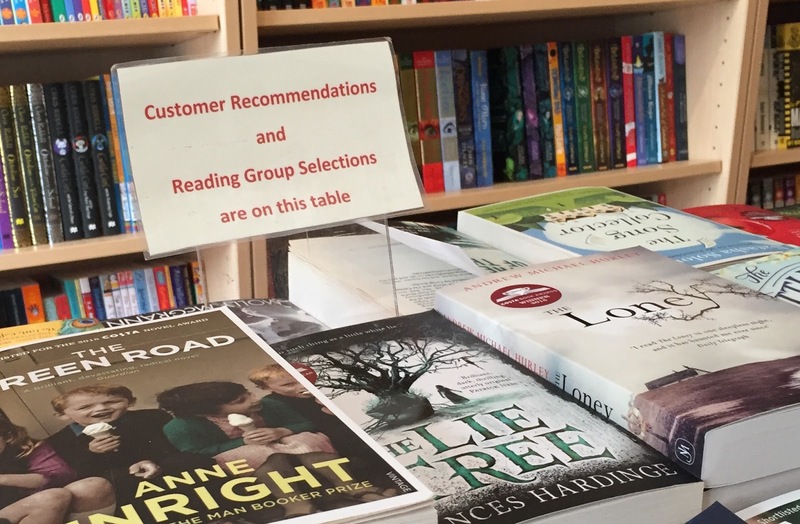 The prevalence of these recommendations, both on the shelves and in my Reading Spa, meant I really respected the bookshop's confidence in its ability to unite readers with the perfect book(s). Bold book recommendations are a vital bookselling skill, and the staff of Mr B's Emporium of Reading Delights have that talent in spades – which meant all I had to do was relax and enjoy my spa. *I try not to complain on the internet - there are already enough people doing that - but if you’re a fan of Jane Austen DO NOT visit this centre. I felt it was frustrating, misleading and a waste of my time and money. Instead, buy yourself a copy of Persuasion, sit in Queen’s Square and read it, then later relive the walk up Union Street and along the gravel drive to the Crescent. It’s a much more rewarding way to spend your time. 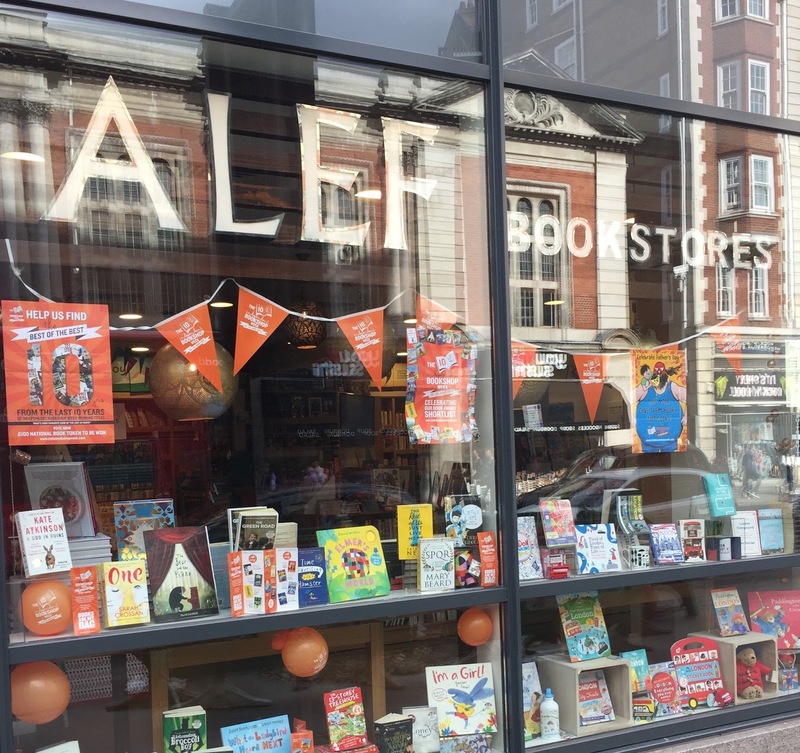 Last week was Independent Bookshops Week, which meant seven days of bookshop-related fun, culminating in a day of bookshop crawls. 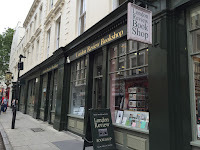 For me it also meant one of the biggest tests I could put my new man through: Would he be able to keep up with my dedication to bookshop crawling? 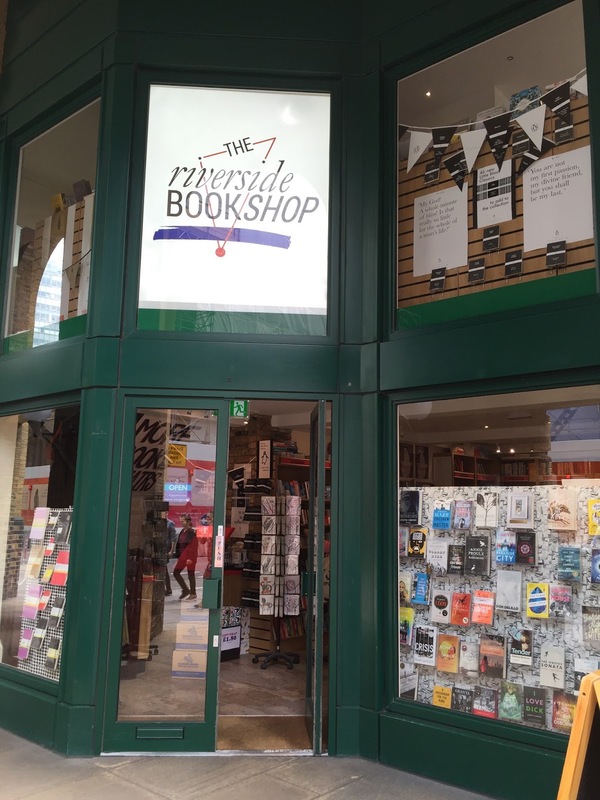 The event is a brilliant celebration of the variety of independent bookshops and he certainly embraced the moment, joining me on the IBW website as we planned a route of around 15 bookshops. Leaving one railway station behind, our next destination was near Waterloo, on Lower Marsh. 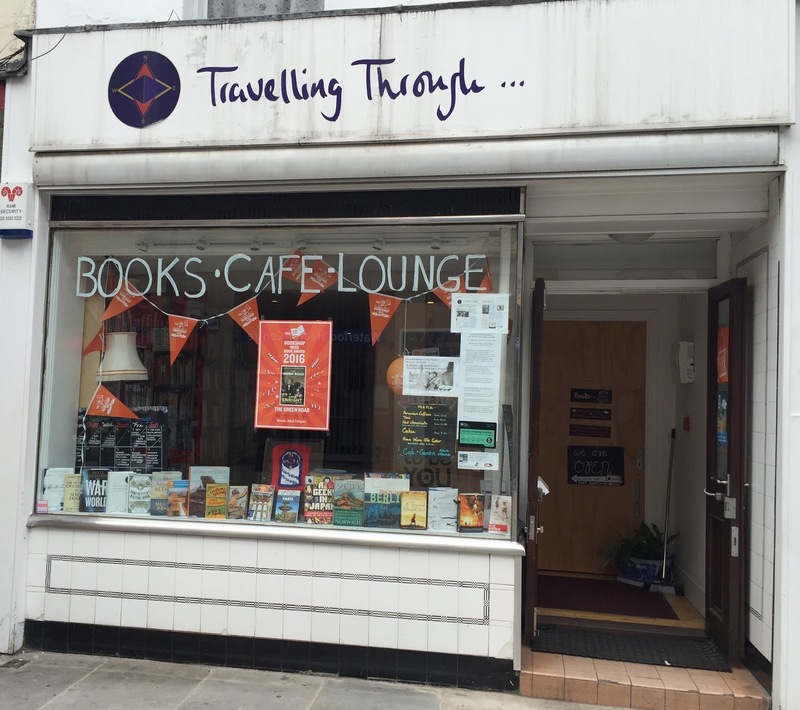 Travelling Through... is a small but perfectly formed travel bookshop, with a cafe downstairs. 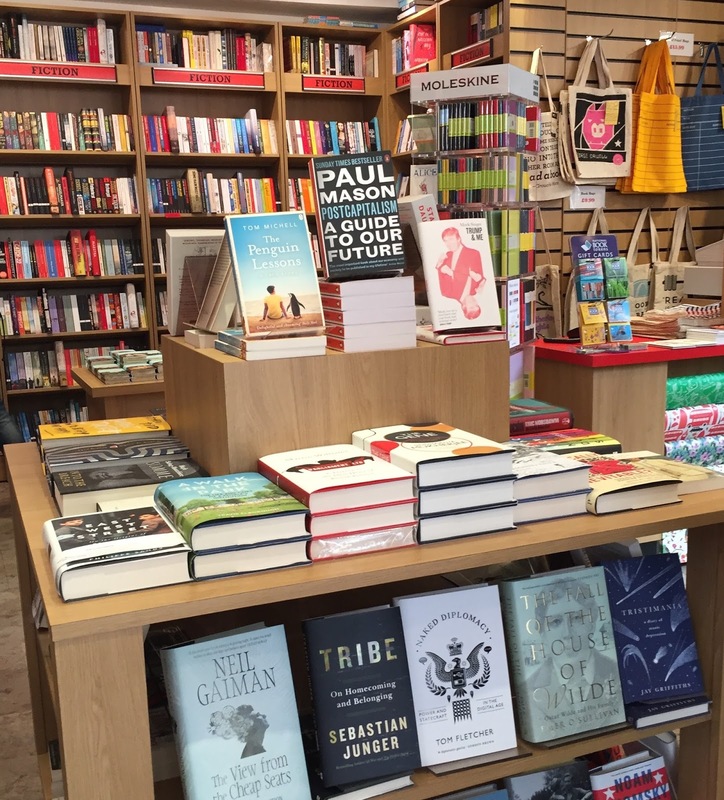 Fiction is arranged geographically along one wall of the main shop, with a few other treats and a secondhand section downstairs. 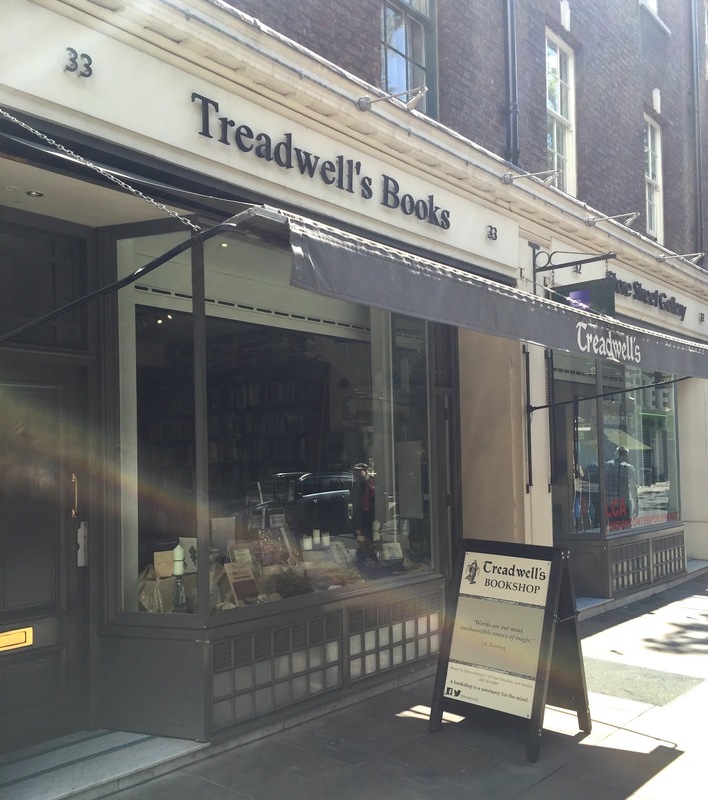 I enjoyed chatting to the bookseller and asking for a recommendation. After some discussion he helped me choose Anne Enright's The Green Road. By this time we'd spent far more time browsing than we'd allowed for – bookshops are great on your own, but when there's someone with you to share the joy they're even more fun – and so it was time to revise our list of destinations down (apologies to those bookshops we didn't visit this time). Heading off to the South Bank, he took us to a new-to-me Foyles. Given its location I'd always assumed this would be a small outlet. I was wrong. We briefly lost each other among the shelves of this bright and airy bookshop by the river, which was filled with browsing passers-by. Here I made the mistake of picking up a heavy doorstop, but I'm very much looking forward to reading Neal Stephenson's Seveneves. 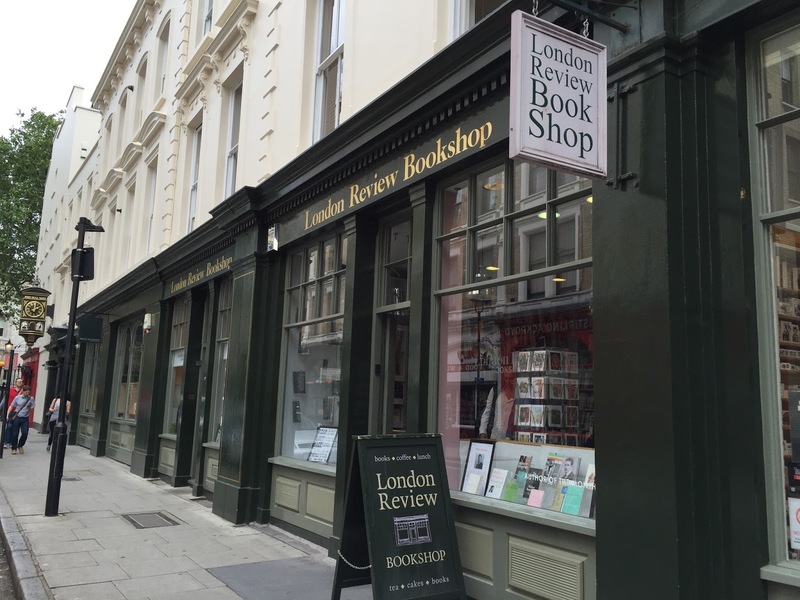 Stop four was only a flying visit because we were short on time but I needed to introduce him to the wonder of London Review Bookshop and its accompanying cake shop. I allowed him long enough to be impressed before insisting we keep going. As I've previously visited this bookshop many times I hope they'll forgive me my lack of purchase this time. 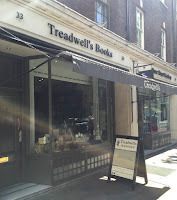 Leaving my comfort zone behind, it was time to head to Bloomsbury, and the atmospheric (and esoteric) Treadwell's Books. 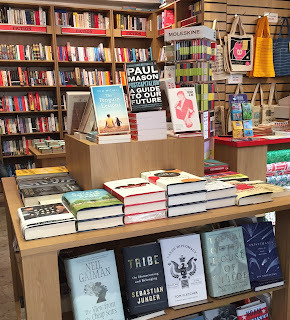 I have to admit when I first walked in my thought was to run away, but a friend of his recommends the bookshop so I was determined to stay and find my comfort zone in very unfamiliar territory. 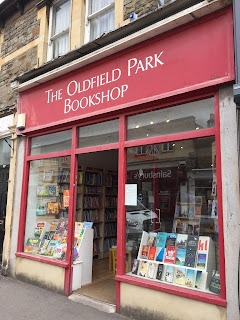 Patience pays off and I'll look forward to telling you more about this one and the interesting selection of books and friendly welcome I discovered. For now I'll simply say I bought A More Perfect Heaven by Dava Sobel. A mere ten-minute walk away, our next stop was French's Theatre Bookshop. Packed with scripts, acting tips, theatre biographies and more, it even includes a section for plays currently being performed. Surely a great place to visit if you're unsure what to see at the theatre? 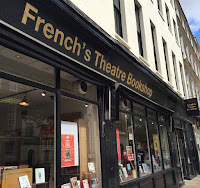 I was thrilled to find several different publications of my favourite play and a very patient bookseller to talk me through them. I'm now looking forward to reading Oscar Wilde's The Importance of Being Earnest. 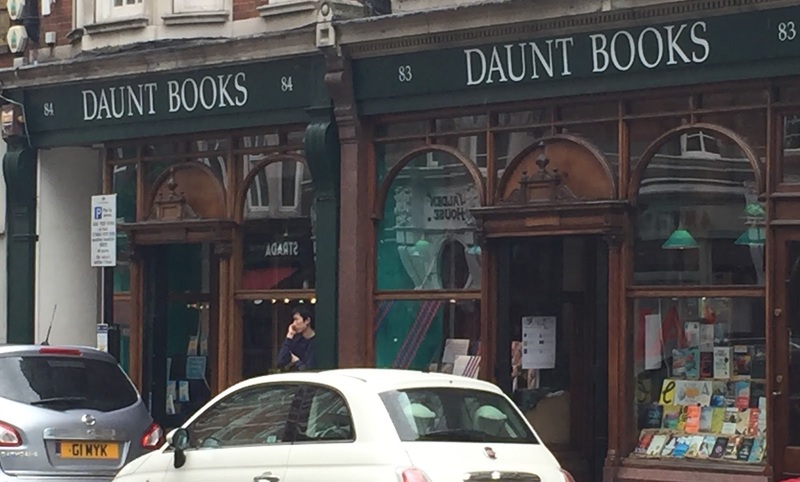 For number seven I was the one being introduced to another new-to-me place, as he took me to a bookshop he knows and loves: Daunt on Marylebone High Street. When we were outside I confess to being a bit disappointed by its small shop front, but we all know appearances can be deceiving and I'm still in shock over the beauty and space hidden behind that tiny front. 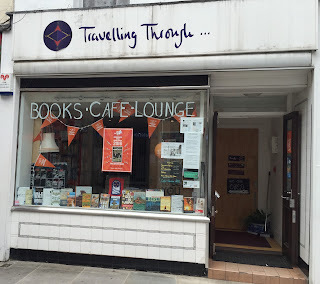 As this is a travel bookshop we bought from different areas of the globe, with him selecting Thomas Mann's Buddenbrooks and me Jose Saramago's Skylight. I also picked up Book Lovers' London by Andrew Kershman, which should become a handy travel companion. Finally, we headed off to our eighth and last bookshop: Alef Bookstore on Baker Street. I have to be honest, at the time of visiting I didn't realise this one was part of a chain, but as I believe it to be the only outlet in Britain and it was included on the IBW events page I still think this friendly Egyptian bookshop counts for the day. Carefully balancing a mix of English and Arabic language shelves, Alef is a friendly, welcoming place of multiculturalism. 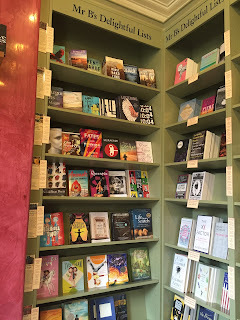 I wanted to embrace my surroundings but faced with a broad selection of fiction by authors I don't know – and tired after walking across half of London – I decided the best way to get the most from the bookshop was to ask for advice. The bookseller suggested one of his favourites and so I bought Beer in the Snooker Club by Waguih Ghali. At this point it was almost closing time so we retired to a nearby pub to recover. If I'm honest, I was the one suffering the most. 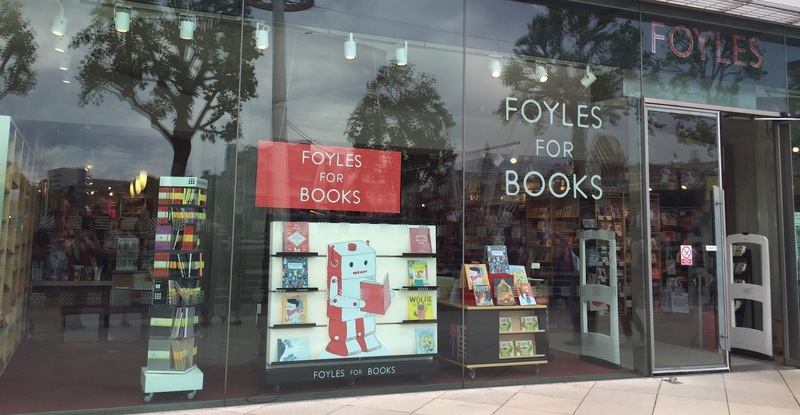 I may have been the one who's used to travelling across London visiting bookshops, but he was the one more able to keep going at the end. Which came in handy for him having the strength to carry all our shopping. *I'm joking of course. We read the first few pages of Chernobyl Prayer on the train home and I reckon it was the purchase of the day. He needs to hurry up and finish reading so I can borrow it.